Ron Garney and Bob Wiacek Captain America V3#1 Splash Page 6-7 Original Art (Marvel, 1998). An incredible collage of images from Cap's past! This is from the first issue of the "Heroes Return" era that saw Captain America (and many of the other Marvel main characters) return from the "Heroes Reborn" Universe (which had been drawn by several of the Image Comics artists). This was the return of the Cap that fans were clamoring for. This fantastic two-page spread quickly re-established him as created in WWII, with a young boy named Bucky for a partner, then frozen for decades, and eventually found by the Avengers (Note Iron Man's Mark III armor!). Wonderfully designed, it was created in ink over graphite on two pieces of conjoined Bristol board with a combined image area of 20.5" x 15.75". 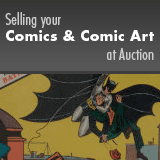 Ron Garney signed in the lower right image area.